This is a salami I made for Carla, combining two of her favorite things: fruity Cotes du Rhone wine and sweet/tart dried cherries. I knew the wine would be an easy addition to the salami recipe, I just needed to choose a jammy, grenache-forward Cotes du Rhone, rather than the tighter, unripe fruit flavors you find in a classic Chateauneuf du Pape old world style wine. Finding suitable dried cherries was actually the harder task, as many dried cherries contain added sweeteners (which might add additional fermentable sugars to the meat paste and create some unwanted acidity or off flavors), preservatives (No. ), or oil (which keeps the dried berries from sticking together). Finally I found a no sugar added, preservative-free, oil-free dried cherry from California while searching online. Had I decided to make this salami earlier in the year, I might have tried drying my own, as this blog post did with Concord grapes...nom nom nom. 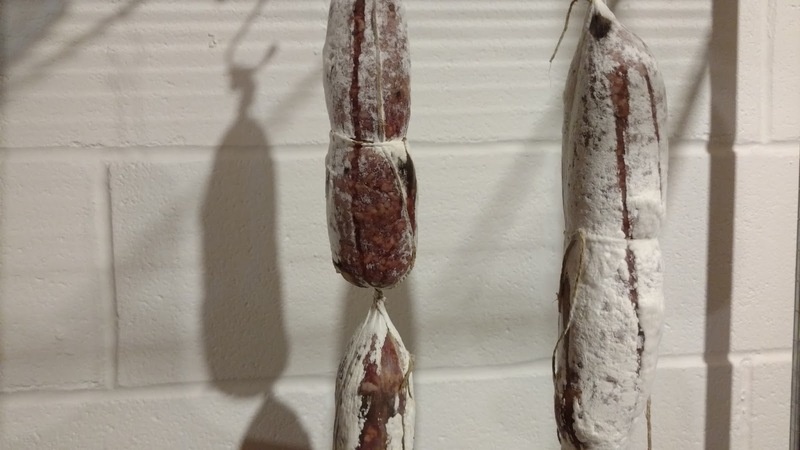 I'm very hopeful for this batch of salami, not just because I talked it up to Carla, but because I think it should be something really special. I stuffed the forcemeat into beef middles and tied some twine around the midpoint of the sausages to apply some additional pressure to the middles. Aside from the usual salt, raw sugar, Cure #2, and B-LC-007 starter culture (my new favorite over T-SPX), I just seasoned the salami with some black pepper. I'm hoping the lack of other seasoning allows the flavors of the wine and the cherries to play off the inherent savory nature of the salami. 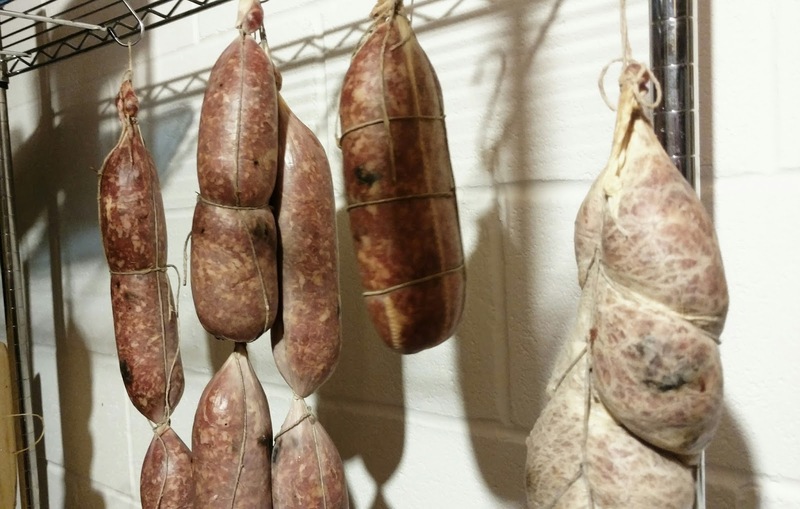 I also packed some of the leftover meat paste into a hog middle (like nduja) and a double-walled casing (to slow the curing process) to see how this recipe changes with different casings.